We had two night away in a hotel booked through Groupon, it was a trip we didn't think we were fated to have though. We had originally booked a hotel in Teesdale before Christmas but changed it to March as we were so busy. Then a few days before we were due to go in March. I checked the hotel's web site to look at the food menus, only the web site had gone. I phoned then and there was no answer. I look for news on the internet and found that the tax man had closed down the hotel a few day previously. We got a refund from Groupon and rebooked a place near Lincoln, somewhere we had never been, then just days before we were due to go Dot's mother took ill and we had to rearrange again. When we eventually arrived at the Hotel I was surprised to find it was still there. 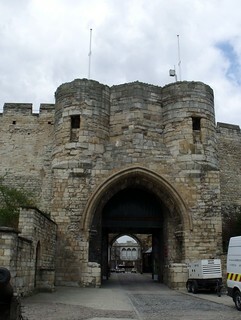 As we only had two days and part of the first day would be spent driving, we thought it would be a good idea to visit Newark on day one, then Lincoln on day two, when we would have more time. In Newark we parked in Waitrose car park and popped in to the shop (mainly to use the toilets) but found lots of new beers in there and decided to call back latter. 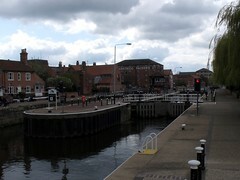 We walked the short distance to the river and the bridge but we didn't cross over. 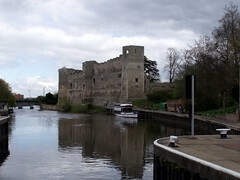 We walked by the river for a while to look at the castle, and then on to the lock gates before crossing over there and heading into the centre. It was Sunday and there weren't many shops open, then just as we were passing the Wetherspoons, it started to rain, so we called in for lunch. I had to have a beer with lunch, just to wash it down you understand. 5.0% gold colour with a good head,the aroma is of hops and the taste is a bitter but smooth citrus hop, only had the one though as I had to drive to the hotel later. As most shops were shut, we made our way back down to the river for a short walk, found a couple of footbridges to photo and then went back to Waitrose, where I spent quite a lot of money on beers. Checked in at the hotel and as there was no bar, we headed back out to the pub in the village about a mile away. The Green Man (St Vincent Arms?) in Norton Disney, is a very nice friendly pub, with some very good beers on tap. The food also looked good but we had eaten. So we stopped for several beers and Dot drove back to the hotel, thanks Dot. 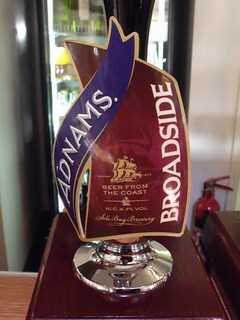 First I had, Adnams, Broadside from England. 4.7% (the bottles I had were 6.3%) deep amber with a good head, caramel malt aroma, very nice fruity caramel malt taste. I never realised before that the draught version was only 4.7%. 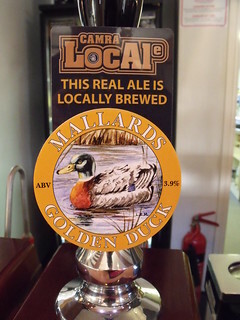 Next I had a local brew, Mallards, Golden Duck from England. 3.9% gold colour with a good head, lemon and hop aroma, sweet but dry citrus hop taste, very nice but I moved back to the Adnams afterwards. 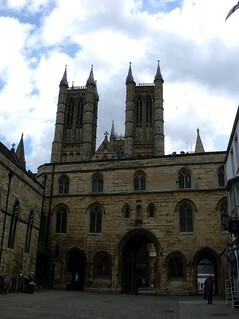 After an excellent breakfast and discussing our planned trip into Lincoln with two other couples, also down for breakfast, we made an early start for the city. 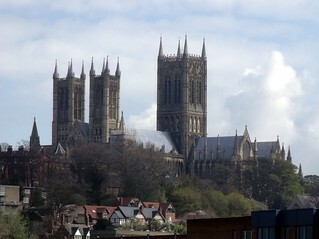 There is no park and ride for Lincoln, just plenty of pay and display car parks, we headed for a Morrisons supermarket in a trading estate just over the river from the city centre. It was also a pay and display, most on the trading estate where but B&Q next door wasn't. So we parked there, Dot wanted a couple of things from there anyway. The route we took into the centre was a bit of a long way round (we came back by a different much shorter route) and headed up towards the cathedral. 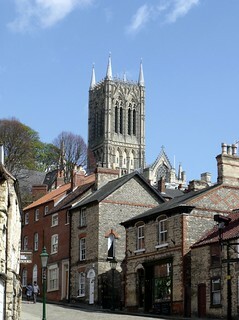 When I say up to the cathedral I mean up, it is on top of a very steep hill, we took our time climbing to the top, stopping to look in various shops along the way. At the top of the hill we had a quick look at the castle before wandering over to the cathedral. I did not think we had enough time for a tour of the castle on this visit. 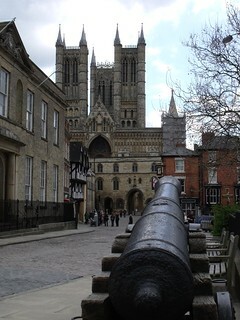 We went through the old Exchequer Gate across the yard and into the cathedral. 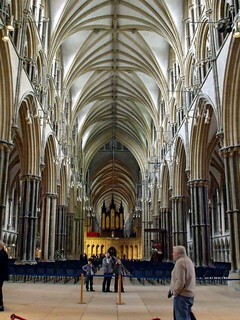 Inside the cathedral it is as magnificent as any cathedral and unlike the one we would visit the next week, there is no charge for taking photos. 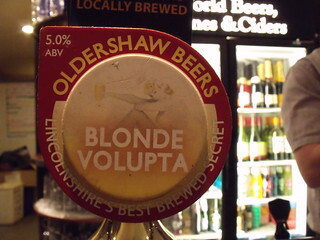 Ralph wrote, "I never realised before that the draught version was only 4.7%." Unfortunately Ralph, it is happening all to often, but we the customer are still being charged the same price (and more sometimes) per pint.